Taking up the guitar when he was only three years old, Jeff Healey was a truly gifted and unique guitarist from a very early age, unconventionally holding the instrument across his lap as he had lost his sight as a baby due to a rare form of cancer (retinoblastoma). Healey formed his first band at 15, but soon after put together The Jeff Healey Band. Healey formed his first band at 15, but soon after put together The Jeff Healey Band. After his appearance in the movie Road House, Jeff signed to Arista records, and in 1988 released the band’s debut Grammy-nominated album See the Light, which included the classic hit single, “Angel Eyes”. However even before this release, Healey was already becoming an internationally-known star after sharing the stage with many of the world’s finest musicians, including B.B. King, George Harrison. Mark Knopfler and Jimmy Rogers. 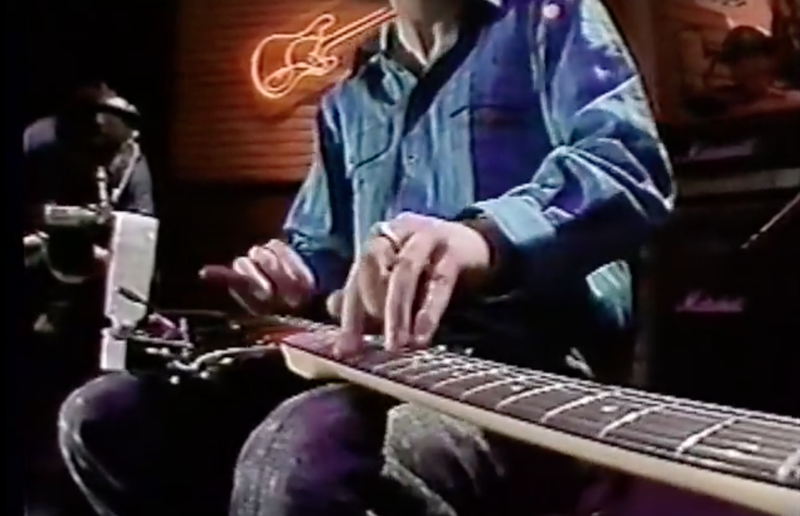 In the clip below, you can see one of those great live collaborations, when Healey took part in a performance of “Look at Little Sister” with Stevie Ray Vaughan and Double Trouble in 1987, on a CBC series called It’s Only Rock ‘N’ Roll. Two of the best and both of them gone … I’m so glad we got to see Healey the last time he was in Edmonton, just months before he died, as it happened. Brilliance.